When should I start composting? What do I add to the pile? How long does it take? Can I add.....? I get composting questions all the time from friends and family; my answer is always the same - Start with leaves! 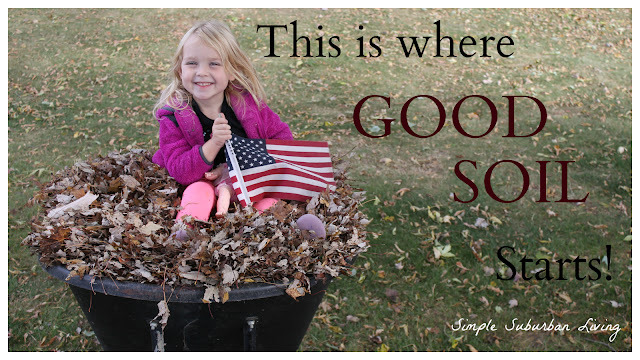 In this video I talk about our method of starting our compost pile each fall. We usually get enough to let it cook down twice per year which equals a lot of fresh homemade compost for our gardens. I have talked about this before in my fall composting with a string trimmer post and also in last year's easy composting method video. Good compost starts with leaves! they are all around us in the fall time and unless you live in the deep south, the jungle, or a desert you have plenty of leaves to use. Even if you don't want to rake up your own leaves there are probably plenty of your neighbors who are bagging up theirs and leaving them at the curb for the city to pick-up (if your city does that kind of thing). The bottom line is this, get as many leaves as you can because they are going to be the base of the compost you will use throughout the entire year. Once I have all of our leaves raked up I start carting them to the compost pile in the back corner of our lot. It is nothing special, just a few cheap metal posts, some garden wire fencing, and a pile of leaves and food scraps in the middle. As I am carting the leaves to the pile I also take care of cleaning up the garden beds of all dead and dying vegetable plants from the summer and layer those on the pile in-between loads of the leaves. This creates a layers of alternating carbon material (leaves) and nitrogen material (green plants and food scraps). Once I have all of the leaves in I top it off with our food scraps from the last couple of months that have been saved as the compost from the summer finished up. This is all that needs to be done for the fall. Just let the pile site and you can add your food scraps to it all winter long. If you prefer you can also cover the pile as many like to do but I have found that to be largely unnecessary. In the spring time you need to start turning the pile with a pitch fork every couple of weeks and get it cooking down. As the temps rise it will start to reduce in size and after about 60 days you will be ready to add this fresh homemade compost to amend your gardens. There should be no need to ever, and I mean ever, buy fertilizer for an everyday garden. Compost can provide all of the macro and micro nutrients that any plants need. Give it a try, you'll be happily surprised!